A worker trapped under a "huge amount" of cheese after metal shelving inside a food distribution warehouse collapsed has been freed. Forklift driver Tomasz Wiszniewski walked out of the building unhurt after an eight-hour rescue operation. Rescuers said it appeared as though Mr Wiszniewski had been saved by the protective cage on his truck. Rows of metal racking came down in the building on Hatton Road, just outside Hinstock, Shropshire at 9.40am. Fire crews used drones and cut through the roof in order to locate the missing worker. Shropshire Fire and Rescue Service described the search as one of the biggest in its history. Mr Wiszniewski, who is from Poland, smiled and chatted to paramedics as they checked him over after his ordeal. His family have been told he is safe and well. His colleague Debbie Belcher said there had been "complete fear and dread" when it emerged he was trapped. "I can't imagine what he's been going through," she said. "The sense of relief is just immense. We couldn't have hoped for a better outcome." Crews used specialist cutting equipment to get inside the building to try and free the man after the tangled wreckage of shelving proved impossible to navigate. A drone was used to look amongst the shelving for the missing worker. Sniffer dogs from Merseyside also assisted with the search. An investigation is now under way to determine how the racking collapsed. Shropshire Fire and Rescue spokesman Malcolm Stevenson described the racking, which was storing cheese, as being like inside "very large warehouses like those of Tesco and Argos, to keep huge amounts of stock." "It's metal racking, virtually up to the ceiling, pretty high, and it's full of product of various size. "The racking is organised in corridors. Most of that has fallen over and collapsed." He said the building, which belongs to haulage company Edwards Transport, was intact but that there had been "bowing to the sides". 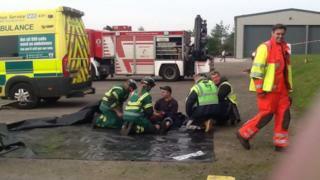 West Midlands Ambulance Service earlier tweeted one other person had been treated for the effects of shock.